Agricultural Research Service (ARS) scientists have found a cost-saving strategy for cotton growers in Alabama who use cover crops. Cover crops are gaining popularity because they suppress weeds and help soil retain moisture and nutrients. 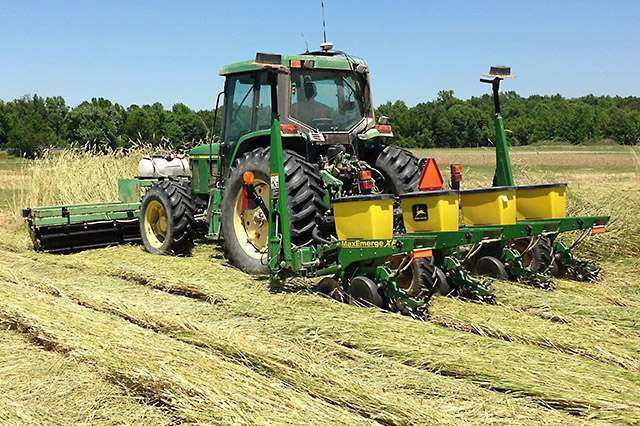 Farmers typically plant cover crops in the fall and kill them in the spring by flattening them with a roller, spraying them with herbicides, or both. After killing the cover crop, growers plant a "cash crop" (meaning, grown solely for profit) in the same field. Cotton growers in Alabama often use cereal rye as a cover crop, killing it when it starts to produce seeds. Farmers will then wait, sometimes up to 3 weeks, before planting the cotton. This gives the rye time to die off, so it won't compete with the cotton for soil moisture and nutrients. But it also means two passes of a tractor: one to kill the rye and another to plant the cotton. 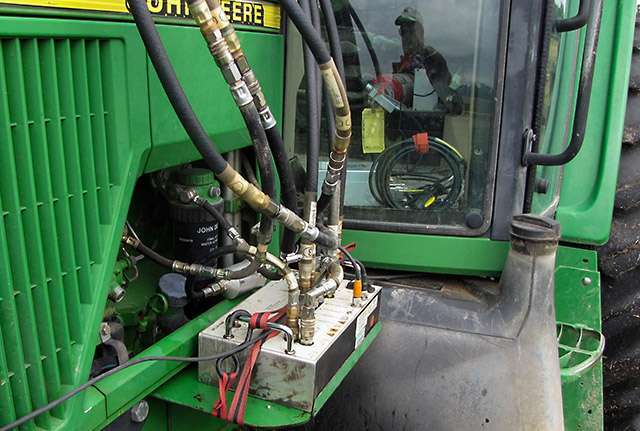 ARS agricultural engineer Ted Kornecki wanted to see if farmers could save on labor and fuel costs by making just one pass of a tractor equipped with a roller, a seed planter, and an herbicide sprayer. "It may be a strategy worth considering, now or in the future, given rising fuel and labor costs," says Kornecki, with the ARS National Soil Dynamics Laboratory in Auburn, Alabama. In their studies, Kornecki and his colleagues planted a rye cover crop in the fall and killed it in the spring. They then planted cotton with either the two-pass method or the new one-pass method. For 3 years, they compared the number, vigor, and seed cotton yields of the cotton plants. They also calculated costs for tractor fuel and labor for each pass of a tractor. Predictably, killing the rye and planting the cotton in a single pass saved on fuel and labor costs. Based on a diesel fuel price of $2 per gallon and a farm worker earning $12.55 an hour, the single-pass approach saved about $2,200 a year on an average 600-acre cotton farm, or about $3.67 an acre. In addition to those savings, the single-pass plots also produced an average of about 2.5 percent more cotton per acre over the 3-year period, an increase worth about $24.60 per acre. Kornecki says that in some years, the standard two-pass approach may still make economic sense because of potentially higher yields and revenues. But the results also show that the single-pass approach may be a viable option in the future, particularly if cotton prices stay low and fuel and labor costs continue to rise.